One of the first things you learn when you are working with flash is that you should never point it naked and straight at your subject from the camera. The answer is to get it off the camera and potentially bounced off of something. The second lesson you very quickly learn is to put something in between the flash and the subject. This usually takes the guise of an umbrella, softbox or grid. It can, however, also end up being strange cookie cut designs or any number of weird and wonderful homebrew contraptions that are designed to bend and soften the light as much as possible. Every photographer has their own idea how this should be done so there is never a shortage of paraphernalia that you can buy to add to a truckload of modifiers that you already own but have forgotten how to use. The last lesson you stumble upon is to change the colour of light. And it’s a doozy. I understand why it’s the last since it can be the most confusing and at times the least logical. Here’s the limited amount that I have learned, and hopefully it can help get to lesson 301.
photographer who is able to do this. To get back to the point, the strobe fires what is essentially a white light at the subject. The ambient light around the subject tends to be anything but white. Herein lies the first reason for changing the colour of the light that the strobe fires; to balance the colour of the strobe with the colour of the ambient. 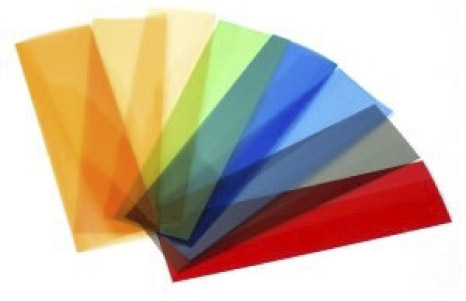 We can change the colour of the flash using thin gelatin filters referred to as colour ‘gels’. Any number of contraptions are out there to affix these gels to the front of the lens. All you really need though is a strip of gel that is wide enough for the front of your strobe and some sticky tape (I prefer electrical tape as it doesn’t leave a residue when I remove it, but ordinary Sellotape can also work). Two of the better known gel manufacturers are Lee Filters and Rosco. You can get filter sheets and strips, with the strips obviously being less pricey. Theoretically these gels are optical grade, but once you have used them a couple of times you are unlikely to want to put them in front of a lens. The beauty of the flash though is that it doesn’t matter how mangled the gel is, it just keeps doing its job of changing the colour of the light. The most used filters are probably the warming and cooling filters, or oranges and blues respectively. A full orange is referred to as a ‘cut of orange’ or CTO. The colours are then ranked in intensity, so that you get 1/2, and 1/4 cuts of that particular colour. After the oranges and blues are the greens. These balance the strobe light with fluorescent light sources that tend to have a greenish caste. The green gels are referred to as ‘Plus Green’ or ‘Window Green’. Again, they are graded down in intensity with 1/2 Plus Green and 1/4 Plus Green. Essentially, when we shoot in a situation where the ambient light is a different colour to photographic daylight we would tend to change the camera’s white balance to match this colour. For example if you are shooting in an office interior lit by fluorescent tube lights, you would probably pop the WB to ‘Fluorescent’ (if you are in Auto WB it is likely to do the same thing). The fluorescents caste a green colour onto everything they light, so the camera compensates by applying magenta to the captured image. Now the fluorescent light turns to a white light in the image. The problem is that the white light of any strobes that you use will also be shifted toward magenta. The solution is to place a green gel over the flash so that it gives off the same colour as the fluorescent lights. This solves any issues with wayward colour castes in an image. Rather than corrections, gels can also be used to create different effects within the image. One technique to create nuclear like sunsets with people in the foreground is to set the WB on the camera to Fluorescent. As mentioned this increases the magenta levels in the image which will make the sunset pop like mad. The problem is that any flash on the foreground will also shift wildly towards magenta. Adding a Plus Green (aka Window Green) turns the light on the foreground subjects to a nice neutral white. The more wildly coloured gels can also be used to give a colour to a white seamless backdrop. A gradient can even be created by snooting the light onto the backdrop or simply moving it closer so that there is a hot center to the light. As with most things photographic, the limits are only constrained by your imagination. 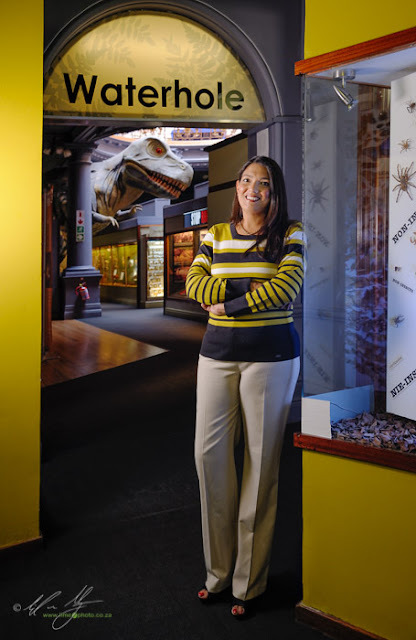 As a quick example in using gels, here is an image I created for Thola magazine of Alison, the director of Durban’s Natural History Museum. The image is shot on Daylight WB (Although I shifted it cooler in post). A 1/2 CTO gel in a softbox was fired as key to her right (positioned so as not to reflect in the glass). A second strobe gelled with a CTB was fired flush against the glass into the cabinet on her left. A final ungelled (the wall was yellow, so warm already) strobe was bounced off a wall behind me to give some fill to her. The ambient exposure was based on T-Rex in the background. The warm gel was to match the warmish lighting that the museum uses. ‘Daylight’ flash would have ended up looking like flash, which I hope I’ve managed to avoid here.